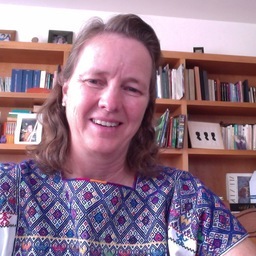 Christina Siebe is a professor in the geology institute of the National University of Mexico and a member of the Soil and Environment (Suelo y Ambiente) working group, in which she studies processes of soil degradation due to anthropic activities. Among these, the effects of agricultural irrigation with wastewater stand out, as well as processes of loss of organic matter, scaling, and dispersion of pollutants by mining and industrial activities. The working group has implemented an observatory of the “Critical Zone” in the Mezquital Valley of Mexico, where it investigates changes in soil properties, groundwater quality, crop quality, and emissions of gases into the atmosphere due to irrigation with wastewater. It also participates in interdisciplinary projects on environmental and health issues. She has published many articles in peer-reviewed scientific journals, and she regularly teaches postgraduate courses and field courses on soils and geomorphology, soil degradation and pollution, and environmental monitoring. She received her doctorate from the University of Hohenheim, Germany. The aim of this contribution is to show how humans have altered the water balance in the basin of Mexico and created an agroecosystem that has profoundly changed Critical Zone processes in a 90,000-hectare area in the Mezquital valley.